We spent a wonderful day touring the Lafoten Islands. Our wonderful guide was extremely friendly and warm spirited. He told us lots of very funny stories from his own life and experiences. We would definitely go on this tour again. Mauricio you are a star! This was a good tour. It gave you the feel of the Islands. It could be better if they allowed you time for lunch and perhaps a little shopping. We stopped at a few really nice villages that had cute restaurants and shops but we had no time to spend. Heimoya would have been a perfect stop for this. We had the opportunity to walk a bit here. It's a beautiful place. We had the chance to be guided by Laura, on a private tour for two. We got to see Eggum, Henningsvaer and enjoy both Atlantic and Norwegian sea sides in 3 islands. 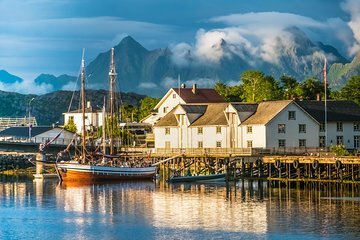 We had a lot of question about Lofoten history and Laura was able to answer them all! We also got to see a lot of birds and have their description by our guide. We never felt rushed and had time to take plenty of pictures and to have a nice cup of coffee! Best experience with this type of tour! This was my boyfriend's birthday and he will remember it forever!! We had excellent service from Marcello. There were only 3 of us on our excursion and he couldn't do enough for us. We stopped wherever we wanted for photographs or just to get out and have a look around. Marcello was very informative and knowledgeable about the Lofoten islands and made the trip really interesting. I would thoroughly recommend the tour to others.We saw far more than we would have done on our own. Fabulous day for my family with Mauricio. Incredible views enlivened by his local knowledge made our tour of the Islands a lasting memory. This is the perfect way to gain an appreciation of the land and the people who inhabit it. We learned a lot about the culture and history of the Lofotens during this trip. We would not have had such a clear idea of what it would be like to live in the Lofotens had we not taken the tour. We very much appreciated our guides. Just a wonderful visit to a beautiful part of the world. But it wasn't just the scenery and traveling through interesting villages, it was the charm and knowledge of Claudia and her husband (who was both driver and tour helper) that made the day so perfect. Highest recommendation! Mauricio and Claudia were awesome, informative, and fun! Got to see various parts of the Lofotens on a private tour. Pick was prompt/early even.